Hahaha, the first thing I noticed in this country are the buses. There are some green ones that look fairly normal, twinkyish in design, and others that look like an evil clown’s jail cell on wheels. Locals tell me these are called Chivas. 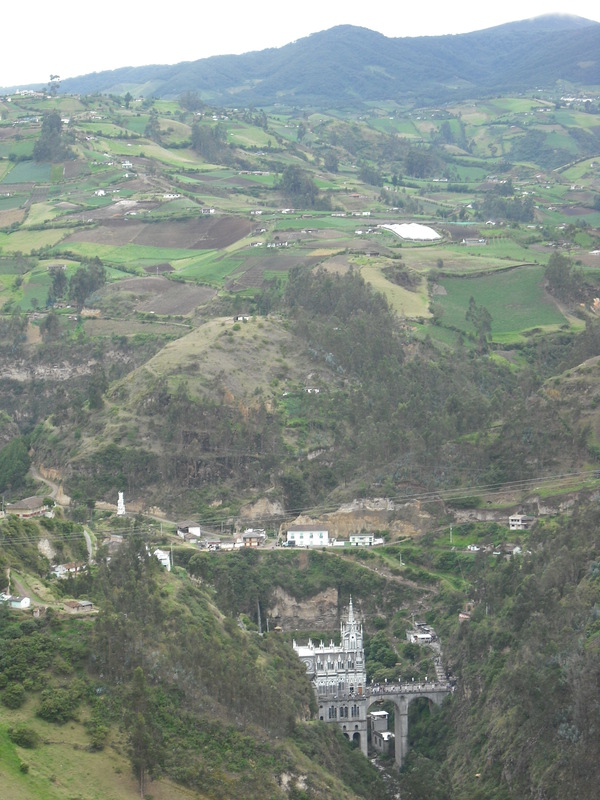 Before I left Ipiales I wanted to visit the church in Las Lajas, which is off the Panamerican. You leave the city, then drop down, down, down into a gorge where the incredible church is built. It took me about 30 minutes to ride the 15k there. The climb out was steep and took about 90 minutes. 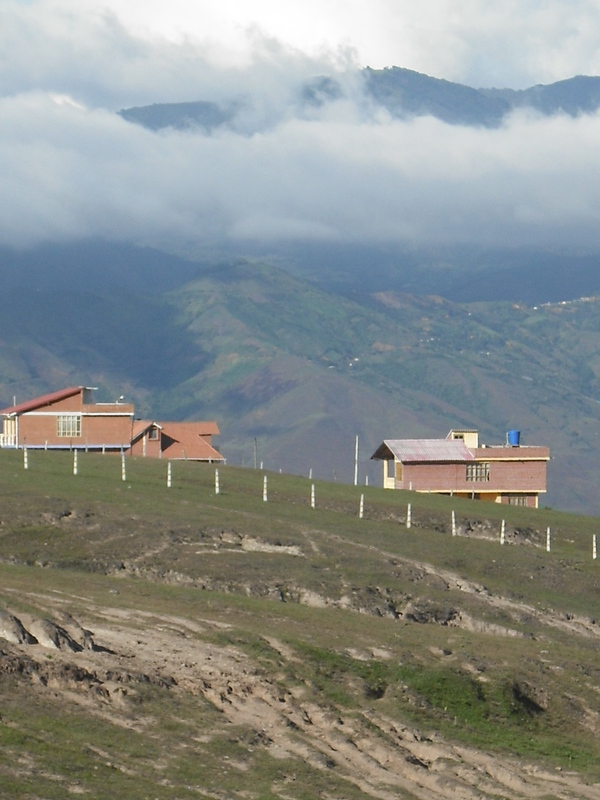 I returned to the fire station, packed up, said goodbye to my firefighter friends and headed for Pasto, 75k away. It was mostly downhill, INCREDIBLE green, lively scenery downstream above a river through a canyon. I am running out of adjectives to describe the views I’m getting on this trip. A new friend and me with a plate of Christmas food she gifted me. Thank you! 1) Today a man standing behind me in line bought me two bottles of water. 2) 10 minutes after that, as I was speeding down a steep road a group of four people saw me coming and held a cold, sealed bottle of water out for me like a hand off in a race. 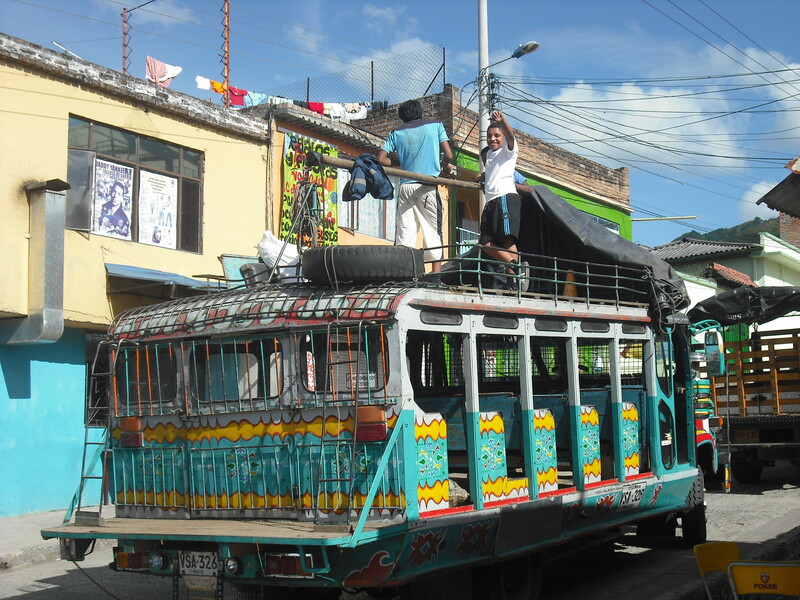 They cheered for me as I announced, “How I love Colombia!” 3) A couple of hours later I stopped for lunch. Thirsty, I ordered an extra glass of juice. 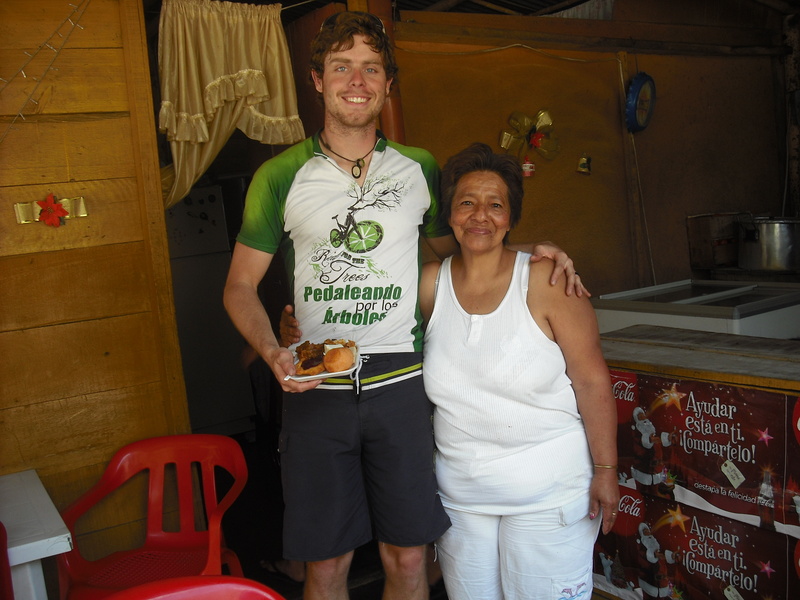 She refused to charge me for it, gave me some extra rice, thanked me for visiting Colombia and wished me a happy trip! 4) Thirty minutes later, on a climb, a car slowed down beside me and a boy held a bottle of soda out the window for me. These are the kinds of storied I hear over and over about Colombia. It’s GREAT to be living them. Yes there are generous people everywhere, and this sort of thing has happened to me a million times, but not so many in just one day. You know a huge percentage of Colombians must be so generous for this to happen so often. THE DOG: I saw a dog lying in the middle of the road with its head up, looking around. A large truck had to swerve around it, into my lane, because the dog didn’t jump out of the way like most dogs would. I noticed there were dark stripes about 5 meters long on the road, from the dog to the side of the road. Was that blood? Could a dog really have been hit by a car and just be lying so relaxed in the middle of the street? I turned around and pedaled back to the dog. On the black asphalt the blood just looked like water. Still not sure if it was injured, I nudged it with my foot. It growled, yelped and ran to the side of the street on three legs. Its front right leg was obviously broken. I went to the only house nearby to inform them, but nobody answered. Colombian Army Camp: Now I’m in my tent behind an Army post, a good safe place to camp out here in the middle of the mountains. I just smashed a bug that somehow made its way into the tent and landed on the laptop screen. Today was almost completely downhill, with the exception of a two-hour climb I would have called absolutely gigantic before I started this trip. The scenery is mind-blowing as usual, but I’ll just let the pictures speak those words. Now I’m at a section of the PanAmerican highway where a bridge crosses a gorge at least 100 feet below. This Army post is essential. I’ve been talking with the troops here for a couple of hours. 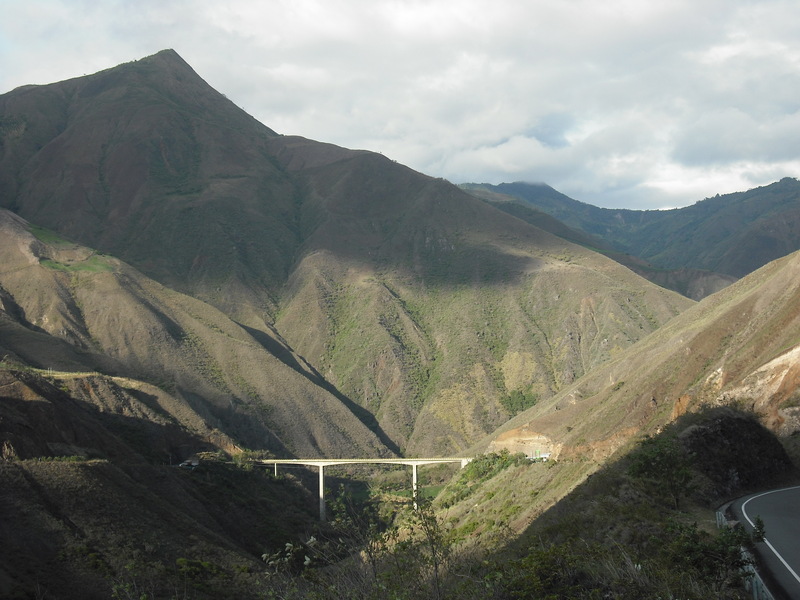 They say that Guerrillas have threatened to take out the bridge, which is essentially the only connection to Ecuador. So they have 10 troops stationed here. They live under a tarp on a hill above the bridge, cook and sleep outdoors. They rotate shifts for a couple hours at each end of the bridge with large, intimidating rifles, and then return to camp. They do this for 7 months, mandatory if you are a young, unmarried male without children. 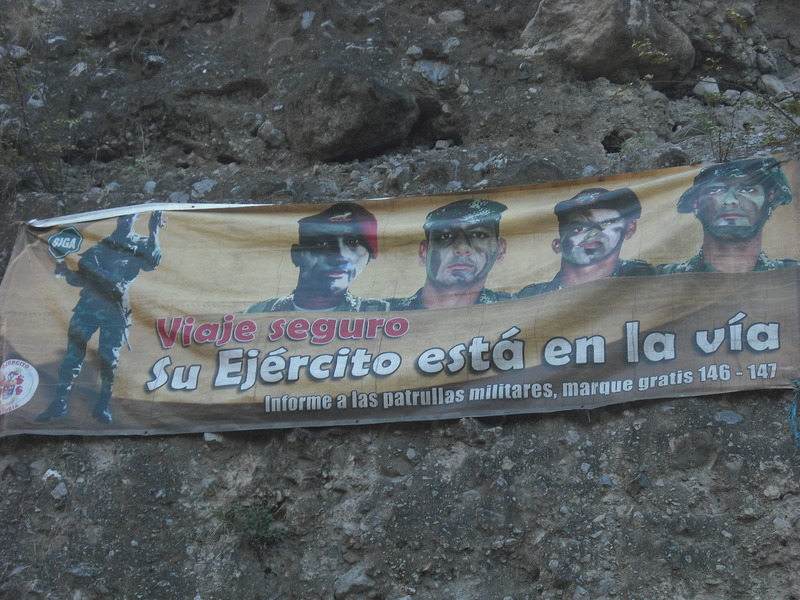 Large banners above the bridge send a clear message to the Guerrillas: “This bridge is protected by the Colombian Army” and giant photos of serious soldiers with their faces painted in camouflage.